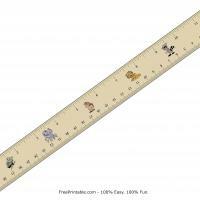 Kids can have an immediate need for special ruler for school called a protractor. Now, with the free printable protractor there's no need to rush to the store and buy one, just create yours with the ease of printing one at home. And, they will have an instant ruler. 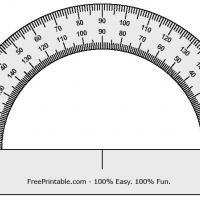 A protractor is useful when they need to have the correct angle for their math subject or some drawing projects. The sturdier the paper the longer it will last. 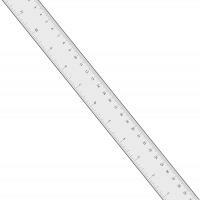 You are only a few simple mouse clicks away from having a protractor to use at home so start printing it now. Never fear, Protractor, a free printable one, is here. Geometry teachers use our free printable math tools regularly to enhance the classroom work. Introduce young students to geometry in a fun way. Print several of these on sturdy card stock and cut them out. 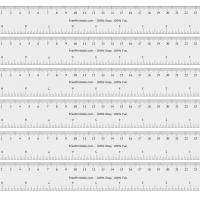 Allow the kids to explore what is printed on a protractor and how it is used. This one can be easily tucked inside a math workbook for safe keeping, ready to use as needed. 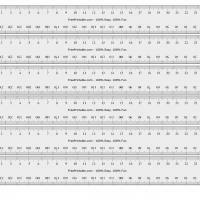 For a beginning geometry lesson, this free printable protractor will do the job. Have you ever been doing a craft project and something is just not right? Maybe you need to calculate an angle, or maybe you need to draw a correct angle. Well, no more will you need to go to the store or go searching for your kid's school supplies to find a protractor. These free printable protractors are just the assistance you need to finish your project. The half-circle design will allow for correct angle plus or minus from 90 degrees to 180 degrees. You will be amazed how easy it is to set-up and print. So easy in fact, you will be back to find more free printable items as a need arises.